Region III includes the states of Alabama, Florida, Georgia, Kentucky, Louisiana, Mississippi, North Carolina, South Carolina, Tennessee, Texas, and Virginia. International members include Mexico; the Caribbean Islands of the Bahamas, Jamaica, Trinidad and Tobago; the Bermuda Islands; the African countries of Kenya, Nigeria, and South Africa; the Eastern European country of Bulgaria; the Middle Eastern countries of Kuwait, Lebanon, Saudi Arabia, Qatar, and the United Arab Emirates; and the East Asian countries of Taiwan and Japan. From 11 states in 1965, Region III has grown to include many international members. When NASPA established regions in 1965, Region III consisted of Alabama, Florida, Georgia, Kentucky, Louisiana, Mississippi, North Carolina, South Carolina, Tennessee, Texas, and Virginia. Over the years, international members were added to the region, including the newly established NASPA areas MENASA (Middle East, North Africa, South Asia) and LAC (Latin America and Caribbean). From 2006 to 2017, Region III participated in the development of support and engagement for student affairs professionals in the Gulf Region and Mexico, and continues to have strong relationships with international members. Region III hosts multiple conferences each year, including an annual collaborative conference. Region III has multiple annual professional development opportunities including the regional annual conference (called the Summer Symposium), the New Professional Institute (NPI), and the Mid Managers Institute (MMI). Additionally, Region III collaborates on an annual conference with the Southern Association for College Student Affairs (SACSA), in which the two associations partner to provide further professional development to the region. The relationship between SACSA and Region III is unique, providing more opportunities for student affairs professionals through partnership rather than competition. Region III members participate in professional development at the state level as well as the national level. Conferences at the state level, whether NASPA sponsored or co-sponsored, offer local opportunities for student affairs professionals with limited funding or travel allocations to engage in professional development. Florida is one example - the NASPA Florida Drive In Conference is popular among Florida student affairs professionals and always sees high attendance rates, climbing to 231 participants in 2011. Due to its popularity, an undergraduate symposium was added to the conference in 2011 and is now held annually to encourage participation at the undergraduate level. 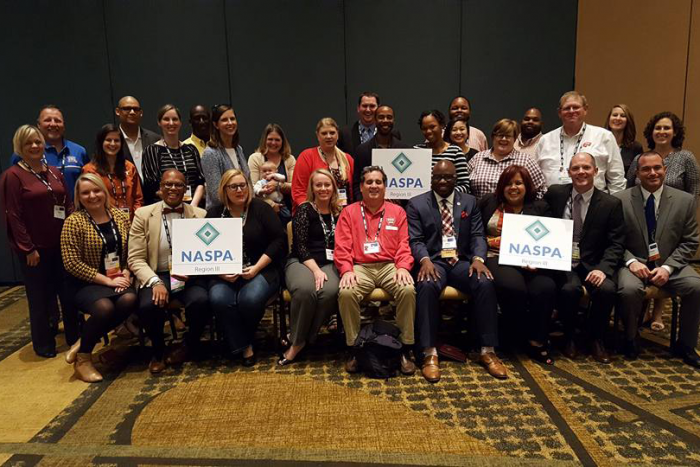 NASPA members in Florida have since collaborated with other organizations to host a variety of professional development events, including co-hosting a Title IX conference with over 100 participants in 2013. Region III members connect locally as well as online. Over the years, Region III has supplemented large regional events by offering other opportunities centered around states or knowledge communities, encouraging participation at a local level. Social media and the use of webinars allow Region III to offer even more professional development opportunities. In recent years, webinars have included topics like Making the Most of Grad School and Work/Life Balance. Additionally, the use of social media and hashtags has enabled the region to engage with other student affairs professionals in the region, as well as around the world. Visit the Region III website on naspa.org to learn more about the region, including the current Advisory Board, upcoming events, and awards. Are you a Region I NASPA member? Get involved!